A perfect gift for that soon to be wedded or recently married couple. This harmonious hand crafted keepsake will be cherished forever. The beautiful music box was gracefully assembled by hand in the town of Sorrento, Italy. The main attribute for this wonderful music box is wood inlay design of 2 rings centered on a ring bearers pillow. 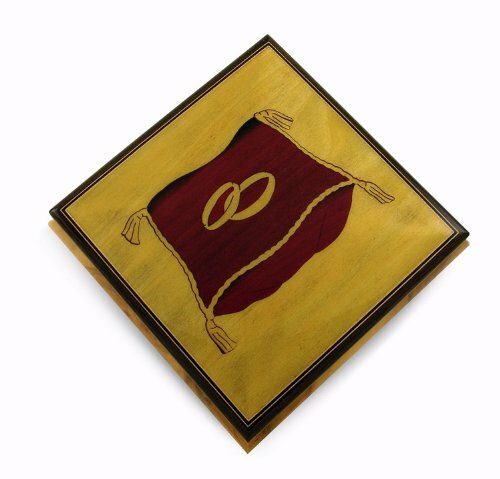 An incredible yellow/crème stain covers the back drop and rings and a gorgeous burgundy stain encompasses the ring bearers pillow. Constructed of solid burl-elm, it exemplifies the highest in quality materials. The extraordinary exterior features is complimented by its plush interior. Listen as the wonders of sound fill the room with a melody only a precision mechanical movement can produce. It will sure bring moments of tranquility time and time again. With over 380+ tunes available, you're sure to find that perfect melody. Please see "item options" for available tunes or visit our "listening station" for all song titles as well as sample clips.